The Accelerance team is continually evaluating the global outsourcing landscape to help our customers find great software development companies who provide great value. We are really excited about software outsourcing in Croatia. Although not historically viewed as a top destination for software outsourcing, we feel that Croatia is quickly becoming an attractive option worth considering. In fact – we feel so strongly about the outsourcing potential of Croatia that, as this review is being published, we have a team of our executives traveling to Croatia to meet personally with software development companies there! In our experience these criteria indicate whether a country can establish and maintain a community of viable global outsourcing companies. Using this analysis, we see Croatia as a true “up and comer” in global outsourcing. This may be your company’s opportunity to establish a relationship with great software development company as an early adopter. Keep reading – and see what we’ve found out! Croatia’s GDP growth in 2018 is on track for a 2.7% rise over 2017. This same growth percentage is expected for 2019. Meanwhile unemployment in Croatia is at an all-time record low. Croatia has an economy that is very heavily service-based. It might REALLY surprise you to learn that Croatia is a very popular tourist destination. In fact, Croatian, revenues from tourism are expected to rise 9 percent in 2018 - from 11 Euros billion to 12 billion Euros. This means that infrastructure and public transportation is well maintained, in order to keep those tourism dollars flowing. After a 3-year pause in business development investment, the government has a renewed commitment to provide tax relief and other incentives for business and R&D. The tech sector, in particular, has welcomed this change – and is enthusiastic about doing business in Croatia. If you check your favorite travel guide, you’ll see reports that that English fluency is high among the population. We can tell you from our personal visit to Croatia – THAT’S COMPLETELY TRUE. Almost everyone speaks some amount of English – and English is very commonly used in business situations. What Kinds of Skills are Found in Croatia? We were pleasantly surprised to find out that Croatia is VERY strong in higher education. In fact, in our 2018 Eastern Europe Analysis Report, Croatia scored better in our evaluation of higher education than their “A-list” neighbors: Serbia and Bosnia. In general, we have found that former Eastern-bloc countries have continued a legacy of strong math and science programs at the universities into the current era. and Slovenia and the Northwest. 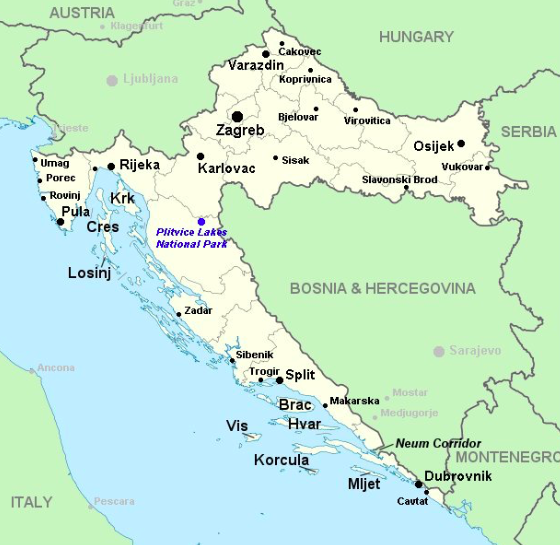 Croatia’s coastline is on the Adriatic sea – directly across from Italy. Because of its location, citizens are often multi-lingual including some ability to speak English, German, and Italian. Where Are the Best Software Companies in Croatia? As we mentioned earlier – Croatia is a very popular tourist destination. Although there’s lots of great history and sightseeing across Croatia, most of the tourism traffic is on the coast – at the Adriatic. But, for our recent visit to Croatia, we chose to go inland to Zagreb, the capital city of Croatia. Zagreb, the “City of Museums” (more museums per capita than anywhere in the world), is great as a tourism spot – but it’s definitely the place to be for technology in Croatia. From our research you’ll find smaller startup software companies on the coast. In contrast, we found that bigger, more well-established companies are in Zagreb. These software companies boast significant clients - including Facebook, Lufthansa, IBM, BBC, Audi and more. We’d love to tell your more about our software development partnerships in Croatia. Regardless of where you would like to find your IDEAL outsourcing vendor, we can create a partner-search based on criteria tailored specifically to your company’s needs. Contact us soon!